Cookies is a small piece of data stored on a client browser. There are three types of Cookies - Persist Cookie, Non-Persist Cookie. 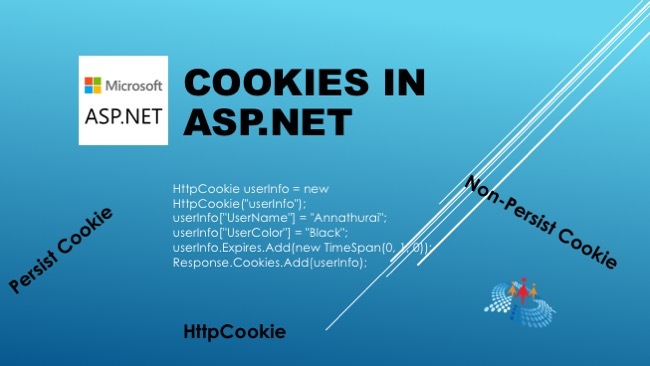 In this article, we will see how to create a cookie in ASP.NET. We'll also see how to retrieve data from a cookie using ASP.NET. Cookies is a small piece of information stored on the client machine. This file is located on client machines "C:\Document and Settings\Currently_Login user\Cookie" path. Its is used to store user preference information like Username, Password,City and PhoneNo etc on client machines. We need to import namespace called Systen.Web.HttpCookie before we use cookie. How to retrieve from cookie? It is easy way to retrieve cookie value form cookies with the help of Request object. When we make a request from the client to web server, the web server process the request and give a lot of information with big pockets which will have Header information, Metadata, cookies etc., Then repose object can do all the things with browser.